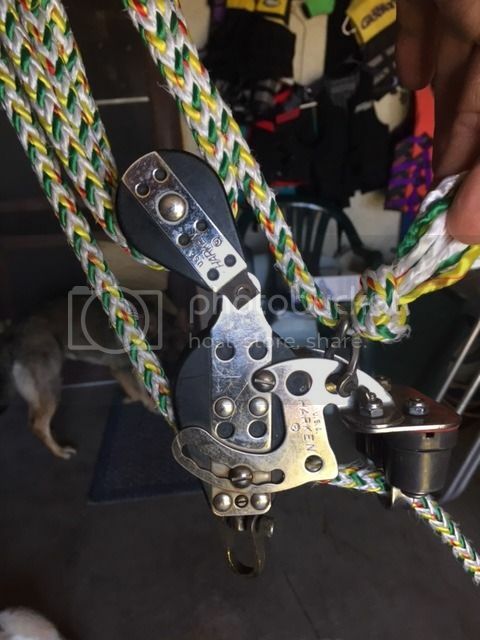 I've only seen just a few H16's, and I am having trouble finding a pic of how to route my main sheet line, for two reasons, first I haven't seen one with this extra pulley under the top 3, and when I'm searching I'm unsure what to actually call it. I've tried 7:1 but I don't find the same thing. Can anyone give me some help? That is not at all standard. It would be 8:1 and way too much purchase for a Hobie 16. Remove the extra two blocks and rig 6:1 as diagramed in the parts catalog page 21. Looks like the wrong type of braid too. 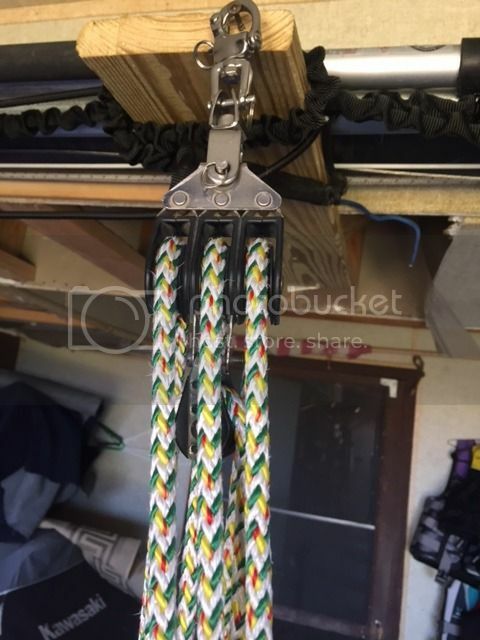 Chuck it and look something like a Sta-set double braid. It appears you could go a size smaller. Matt, by way to much purchase what do you mean? I can see now looking at the diagram the six to one has some advantage in height but what will happen to the effort level when working it? Will it be much harder to sheet in strong wind? If not, since it's what came with the boat maybe it's time to upgrade to new.? Looks like whoever sold you the boat just slapped a couple blocks together and called it a mainsheet system. The bottom block looks like it is a Hobie 18 jib block and the rest of the blocks look like they're "bullet blocks" (small diameter blocks usually used for things like downhaul systems, not mainsheet systems). 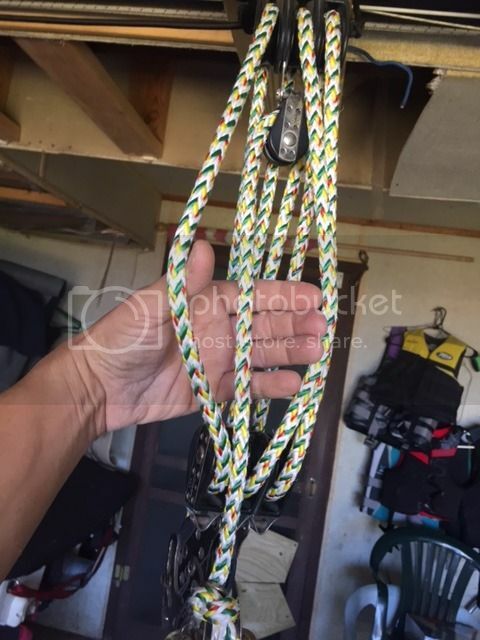 The overall stack height is going to be MUCH higher than a typical H16 mainsheet system so you won't be able to run nearly as much mast rake as you would otherwise and I doubt it will run smoothly when sheeted in tight. It would be 8:1 and way too much purchase for a Hobie 16. 5:1 was original on the H16. 6:1 is now the standard and really easy to sheet the main with it. More than that will actually cause you issues of being able to sheet out... can cause a capsize because it won't respond quickly. Remove that upper inside block and terminate the new line there, at that becket. That gives you a true 7:1, I believe. Check the bearings on each section and lube. If there's a clicker, lube it or turn it off. Should run better. It could use a quick connect swivel shackle below the main block. This is being used on a H16, right? Where mast rake is everything, right? The last thing that setup needs is more parts increasing the stack height. Put another swivel on there and he'd probably have a good 6" of stack height just from shackles and swivels alone. I think you should seriously consider ditching this setup and starting over. What you have is so far from what is typically used on a H16, I highly doubt this will ever give you anything other than headaches. I will defer to SRM on this, and all other matters Hobie...he offers the best advice you can get. Agree. Way to much stack to be anything close to optimum. Current H16 set up is 6:1 and made with two low profile triples. This one has extra hardware at the top, beckets and blocks that add up to alot. The 16 setup is probably something like 7-8 inches tall when sheeted. This allows you to rake the mast back which keeps the bows up and helps the 16 point higher. This setup would mean the mast is well forward to vertical. Would not point well and would have a tendency to pitch pole much more easily. That said... for a recreational sail... not spending money... you could use it. Are you sure it's salsa, there is a similar looking line sold at lowes,? Hmm,.. Does look like green salsa. Yes it's salsa, I bought it from Murrays, or west coast, as was recommended on here. I think I got the correct size so maybe it's a picture not showing it right or I could've ordered it wrong. The stack up was a little less before I added the quick clip on top but it still worked okay until I bought new side shrouds and had to go with 2 ten hole brackets on the front just to get them hooked up. so now i do have some mast rake and it's more effort to get under the boom during a tack, I could also tell the difference in how the boat handled, but as you could guess I feel like I'm losing a bunch of potential because I can't sheet in as far as I need to. I'll be getting a new 6:1 setup very soon. he offers the best advice you can get.